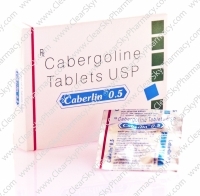 Caberlin tablets are a dopaminergic medication which contains Cabergoline as the active ingredient. Caberlin tablets basically function as dopamine receptor agonist to reduce the amount of the female hormone called prolactin, which is secreted by the pituitary gland. Cabergoline supplements the level of dopamine neurotransmitter in the brain. 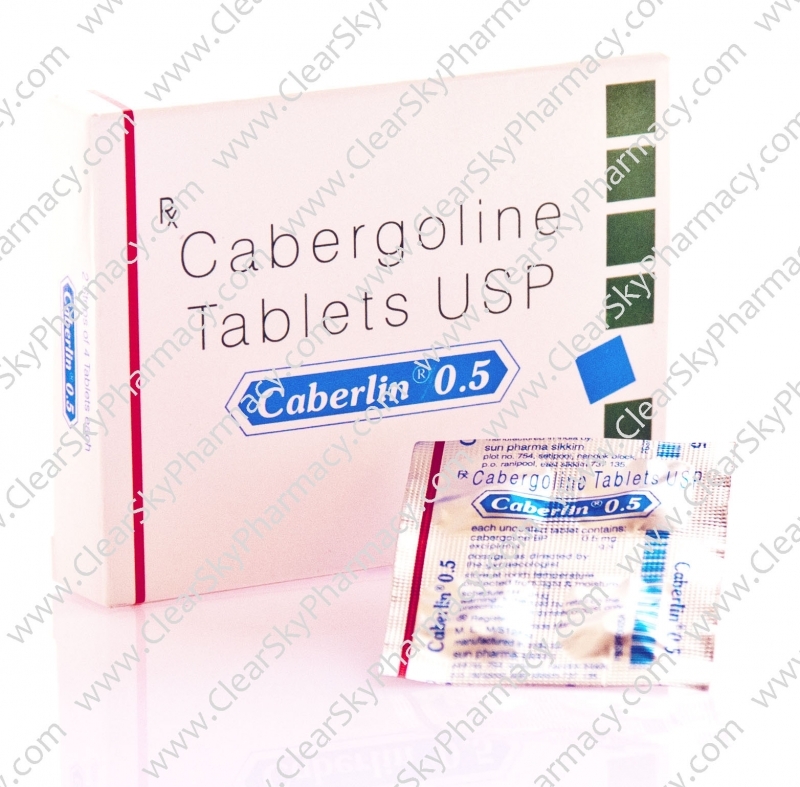 Cabergoline tablets (Caberlin) are prescribed as oral therapy in the treatment of disorders which are caused due to high blood levels of prolactin hormone, a condition known as hyperprolactinemia. High blood level of prolactin hormone results in various medical conditions such as persistent breast milk production, lack of a menstrual period, infertility, and other symptoms. Caberlin tablets are also recommended as treatment in Parkinson's disease. Generic Dostinex tablets are also used by bodybuilders in professional bodybuilding and weight-training athletes during anabolic steroid cycles to increase muscle mass. Caberlin tablets are also used by bodybuilders to decrease the side effects such as gynecomastia that develop due to the administration of anabolic steroids. In our online pharmacy, Caberlin tablets are available in the strength of 0.25 mg and 0.5 mg of Cabergoline. We also have in stock Fertomid tablets (Generic Clomid) which is used for the treatment of ovulatory dysfunction in women who wish to become pregnant. Caberlin (Generic Dostinex tablets) is a synthetic medication which behaves like a dopamine receptor agonist. Cabergoline treatment mimics the properties of dopamine neurotransmitter resulting in the effective inhibition of prolactin hormone secretion by the pituitary gland. Certain people have a high level of prolactin hormone in their body due to the presence of a swelling or non-cancerous tumor in the pituitary gland. This condition is medically termed as hyperprolactinemia. Caberlin Tablets - Missed Dose. If you miss your regular dose of Caberlin tablets (Generic Dostinex tablets), take it as soon as you remember. You can continue your regular schedule the next day. If you remember the missed Caberlin tablets the next day, take your regular dose and skip the missed dose. Do not take a double dose to compensate the missed dose of Caberlin tablets. Store the pack of Caberlin tablets (Generic Dostinex) at room temperature (20 - 25°C), protected from heat, moisture, and sunlight. Retain the original packing of the medication and do not consume Cabergoline tablets (Caberlin) beyond its expiration date printed on the blister pack. Keep the pack of Generic Dostinex tablets away from the reach of children and pets. Do not discard Caberlin tablets along with domestic waste or sewage. Consult your doctor or pharmacist about the correct method of disposal. Before beginning the treatment with Caberlin tablets (Generic Dostinex tablets), discuss your personal and family medical history with your doctor. Inform your doctor if you have liver disease, high blood pressure (hypertension), heart valve disease, abnormal scarring/thickening of the lining in the lungs/heart/behind the abdomen(pulmonary/pericardial/retroperitoneal fibrosis), pregnant or breast-feeding, stomach ulcer, liver problems, circulation problem called Raynaud's syndrome, psychotic disorder, rare inherited blood disorder called porphyria. Please inform your doctor if you have an allergy or have had an allergic reaction in the past to Cabergoline or any inactive ingredient in Caberlin tablets (Generic Dostinex tablets). Consult your doctor if you have developed any allergies to any other ergot medication in the past. The treatment with Generic Dostinex tablets is contraindicated in patients who are allergic to Cabergoline or any inactive ingredients present in Generic Dostinex tablets. Caberlin tablets are also contraindicated in patients who are using other ergot alkaloids which are commonly used for the treatment of migraine and headaches. Caberlin tablets is a category B medication i.e. the administration of Caberlin tablets in pregnant women is not known to cause defects in a developing fetus. However, pregnant women should be administered Caberlin tablets only when it is clearly required and if its benefits outweigh the probable risks associated with the medication. Caberlin tablets stops the production of breast milk in women. The risk of transmission of Cabergoline through breast milk is unknown. Pregnant women and lactating mothers should obtain their doctor's approval before planning a pregnancy or beginning to breastfeed an infant during the course of Generic Dostinex tablets. If you plan to have surgery or any dental procedure, inform your doctor, anesthetist, or dentist about your course of Caberlin tablets (Generic Dostinex tablets). In case of an emergency medical treatment, please inform the practitioner about your course of Caberlin tablets and the details of your last dose. Inform your doctor immediately if you experience any of these side effects. This is not a comprehensive list of all the possible side effects of Caberlin (Generic Dostinex tablets). If you develop any other medical conditions during the course of treatment with Cabergoline tablets, please consult your doctor immediately. You can buy Caberlin 0.25 mg and 0.5 mg Tablets online from Clear Sky Pharmacy. 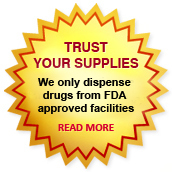 Caberlin pills are supplied in a box of 4 tablets. The price of 0.25 mg pills is only $1.75 each when you place an order for 120 pills.